So, the hot news in evolutionary biology is that women with sons die earlier than women with daughters. Nature, which I read all the time (when I’m not following links tweeted by @zooarchaeologis), reported that each son born shortens a woman’s life by 34 weeks. 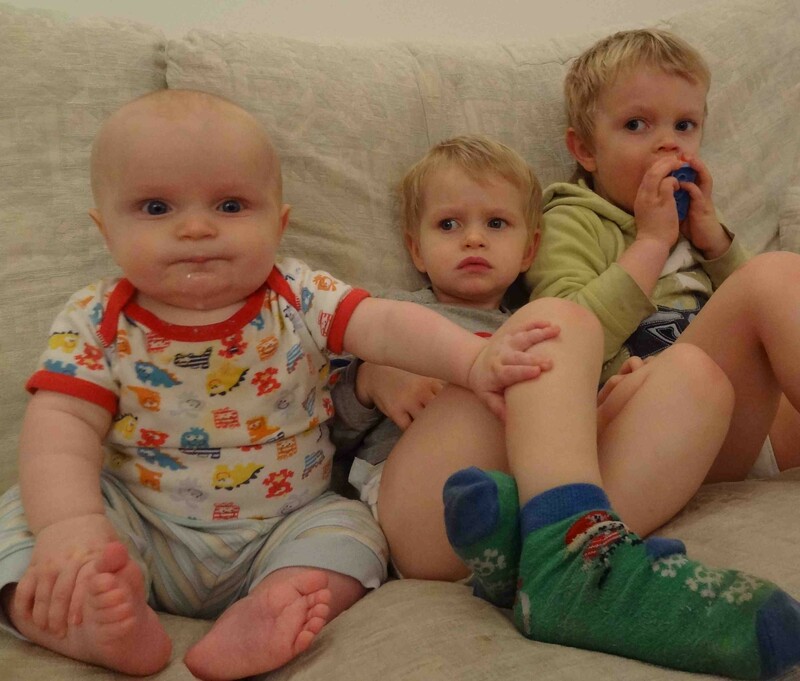 I have three boys, so that’s nearly TWO YEARS of me-time I’ll never get back. But why? The researchers aren’t sure. Their study was based on pre-Industrial Finnish villagers, so it’s a bit late to ask. 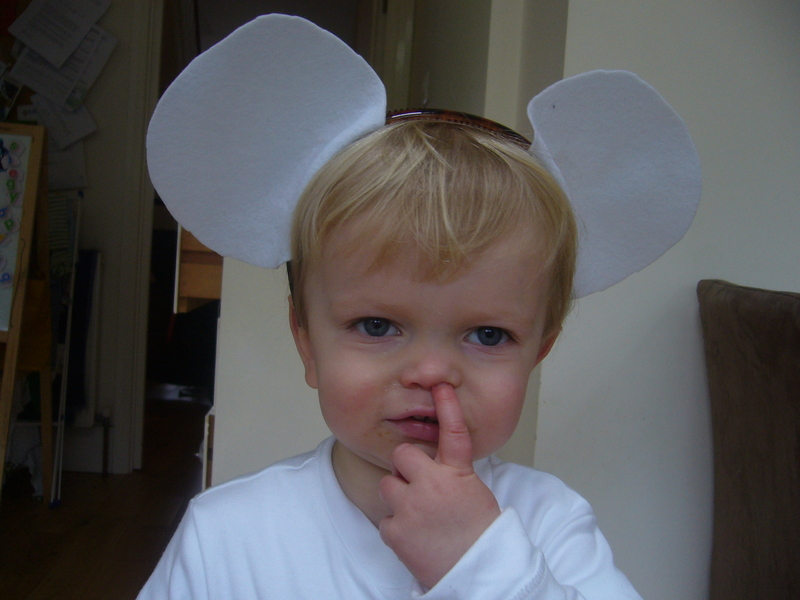 Are the reasons biological (boys are milk-guzzling energy leeches) or social (daughters help more with the housework)? To help unravel the mystery, I devoted a morning to science and collected some data. Our house has pre-Industrial hygiene levels, so I’m confident it will stand. The day begins at 2 am, 4 am and 6 am. Support for the biological theory that boys are “energetically more demanding to breastfeed”. Though I suspect only my baby boys think four night feeds is the deal for the first year. The day really begins at 6.30 am, when my other sons pad into the room. I open my eyes to see my four-year-old walking up the bed, sans nappy. Mothers with no sons lived for 33.1 years after their last baby, vs 32.7 years for mums with three boys. I turn my head and recoil in horror. The nappy is laid out, Godfather-style, on the neighbouring pillow. And it is dry, so I’ll have to reward him for this. Another point for biology – boys spread bacteria. 08:45. The baby naps and the boys are ready for second breakfast. “I’m going to hop to the table,” announces the eldest, carrying four pints of milk without a lid. I remain calm. Crying over split milk could lop a couple of weeks off an already truncated lifespan. 09:08. We need to leave the house at 9.30 am to get to swimming. We’d better get dressed. And they were. A point for the social theory. In a house of boys, nothing is ever in the right place. 10:00. Take children swimming. An aging experience, whatever their gender. Time and a fine-toothed comb will tell if that’s the latest version of tag, or a biological reality. 12:05. Garden time! “I’ve got flowers for you Mummy.” My two year old comes in holding most of a shrub, ripped from the ground. Boys love their mums, but the way they express it often doubles your workload. It’s 4–3 to the social theories. 12:20. 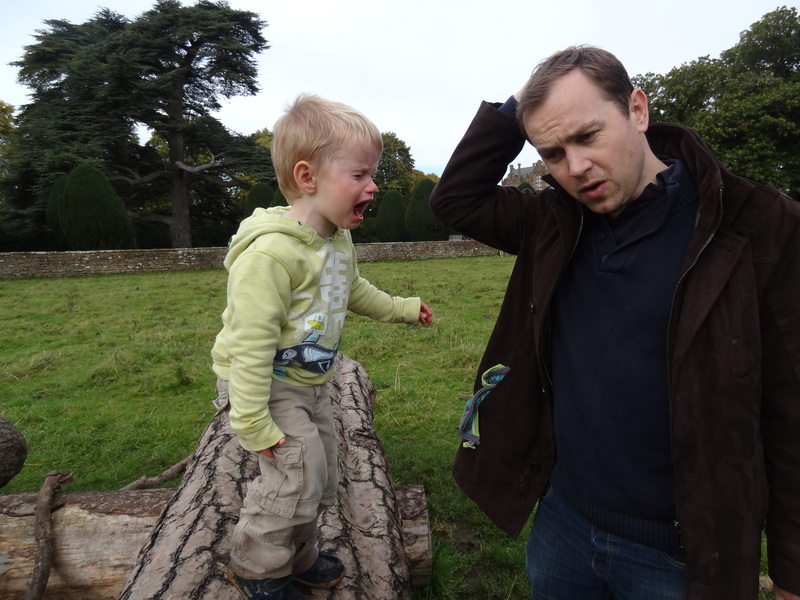 My two-year-old is back inside, in tears, peeling off wet, muddy trousers. He eat three-quarters of my lunch and heads for the stairs. [Fierce voice] “What do you want up there?” Whatever it is, it can wait. That actually seems reasonable. I feel like a mean mummy. As I creep across his bedroom to fetch dry trousers, there is a crunch underfoot, a silent cry of pain, and a light bulb moment. 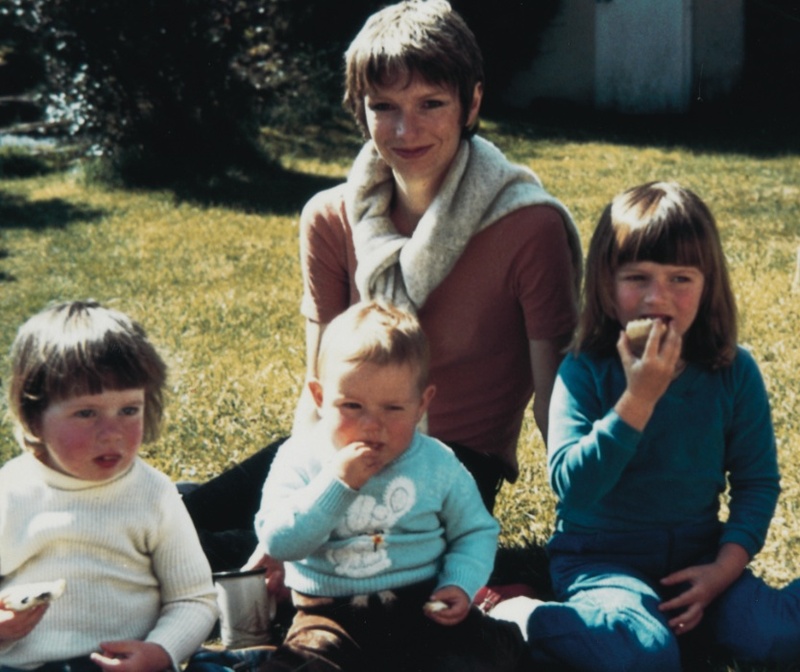 It wasn’t hungry babies, bacteria or even stress that killed those Finnish mums of boys. It was 32.7 years of picking up Lego. There were Mother’s Day cards to collect at preschool pick-up. 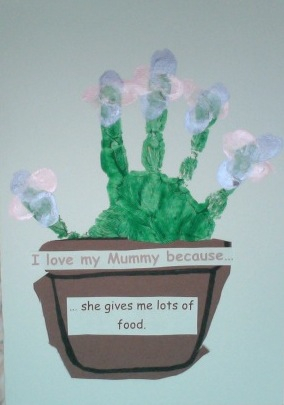 They’d asked every child to answer the question ‘I love my Mummy because…’ and stuck the answers to hand-painted pictures. Added to his assessment of how I spend my time when he’s at preschool, I think they are building up a fine picture of my parenting technique. 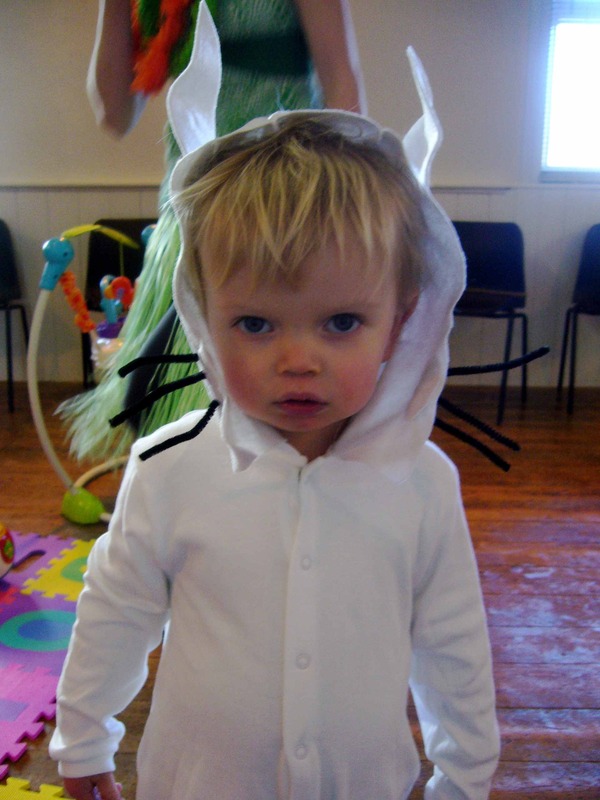 World Book Day costume for mischief makers! I wrote a piece for Guardian Children’s Books for World Book Day on 7 March. Click here to read it on the Guardian website! Happy news: this week saw the publication of MOB Rule, a book that celebrates life as a mother of boys. Like the author, I’m besotted with my bunch. But I know that most passers-by are not thinking ‘lucky you’ as I stride past, towing three trainee men. I know this because so many have taken the time to tell me. It started during my third pregnancy. ‘Are you hoping for a girl,’ and ‘is this supposed to be the girl?’ greeted me in every shop, park and queue. As if I needed an antidote to the boys who had made me want a third baby in the first place. In Neal’s Yard, the manager dispensed opinions along with bump cream, proudly announcing that, “no offence”, she could tell I was carrying a boy. When I darted out after a runaway child, she explained to my sister that three boys meant I must have a hostile birth canal* (*not the anatomical word she used, but the one I wish my sister had used as she relayed the story in the toy shop next door). But I didn’t spend the pregnancy eyeing up pink dresses. I spent it hoping that my luck would hold out, and I would have another uncomplicated labour, another healthy baby. And the apothecary was right: my hostile, girl-rejecting body produced a third perfect baby boy. Congratulations were in order, right? But the comments continued. Small talk, yes, but … I can’t help feeling that a mum of three girls would get a different reaction. I know my own mum did. She was often stopped in the street and congratulated, my sisters and I admired (despite the homemade fringes). Perhaps boys are less loveable to the casual observer. While friends’ girls often appear dressed as actual princesses, eager to tell you their name and engage you in conversation, a boy is statistically more likely to be running off into the distance, shouting and wielding a stick. If you are not a parent to said boy, you may never see how they cuddle like love-crazed baby monkeys; how they constantly pursue fun, food, and fun; or how much less hamstery they smell after a bath. Not that I’d argue that the experience of raising boys and girls is the same. The differences are embodied in three toys that belonged to my sisters and I, which were recently handed on to my boys. An antique cycling Mickey Mouse, kept in a cupboard by my mum for occasional use. Bearlin, a huge polar bear I got for my third birthday, whose cream fur remained pristine for 30 years. And a fluffy cow that still looked new after years of care by three loving girls. In boy world, Bearlin alternates between punchbag and landing mat, and her fur is greying (with muck, I presume, though it could be stress). Mickey Mouse is back in a (much higher) cupboard, minus one ear. And the fluffy cow is lying sodden on the patio, casualty of a Room on the Broom spell recreation (a.k.a. mud and toy soup in a bucket). Yup, life in a house full of boys will be very different from life in the all-female household I grew up in. But I know it will be action-packed, rowdy, and funny, funny, fun. Boys are definitely not a consolation prize. In fact, I feel like I’ve hit the jackpot. I’ve been reading my parents’ parenting manuals recently. It’s astonishing how much has changed in 33 years. 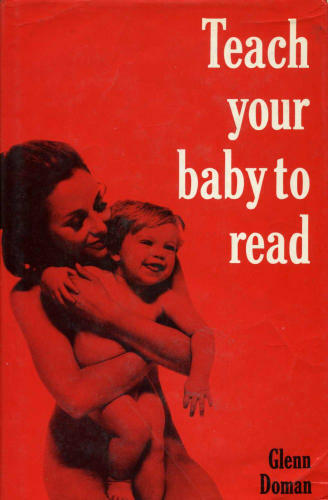 Many 1970s child development experts advised the exact opposite to their modern equivalents. Why can’t my babies read yet? We wear clothes when we look at books. We know pedagogical approaches go in and out of fashion (and phonics is already losing favour in some quarters). What about something more basic, like baby food? I opened my mum’s only baby puree book, hoping to recreate the dishes we had as children. But every savoury recipe includes a teaspoon (a teaspoon!) of salt, and every pudding a teaspoon of honey – up there with soil in the modern parent’s guide to desirable food additives. Plus some very dubious offal purees, which I’m not sure salt or honey could save. Barbara – the f. of bararous, a stranger – a term scornfully applied by the Greeks to all who did not speak their mellifluous tongue. Enid – This is one of those names which would entail on its owner a very grave responsibility, if in the Celtic it means ‘spotless purity’. Hebe – To be avoided, for it is now generic for a barmaid. In any event, dissyllabic. “By explaining the meaning of the name, [this book] saves the parents from making some very unwise – perhaps ridiculous – choice,” the introduction explains. 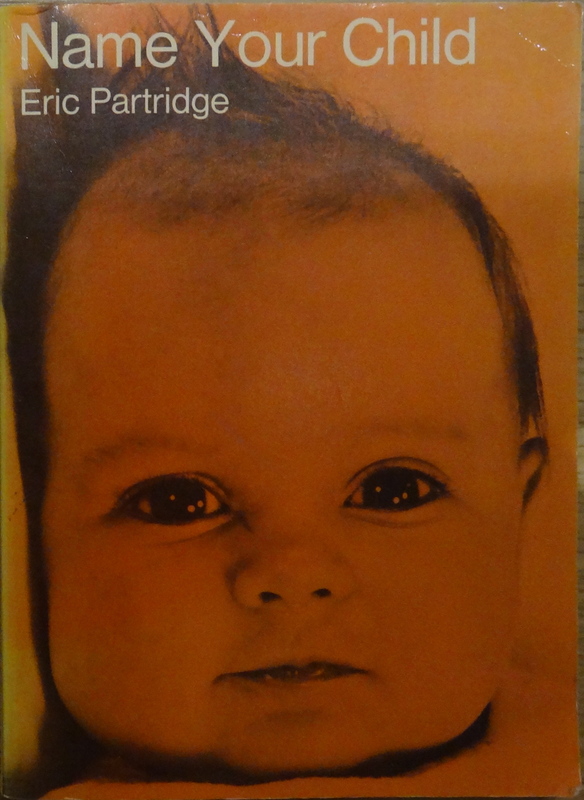 “Remember: it’s the child who carries the burden of an unsuitable name; he’s saddled with it for life.” I wonder what Eric would have made of baby Hashtag. Sound familiar? 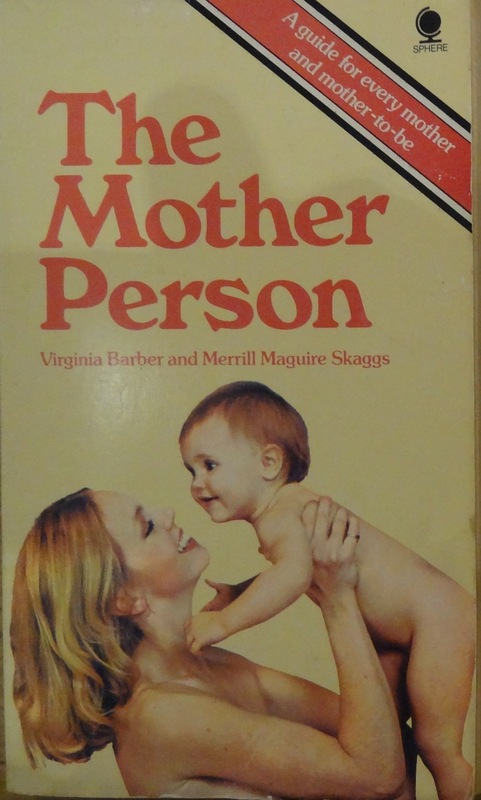 The daily struggle, loss of status and identity, and impossible choices described by mothers in 1975 are strikingly similar to those written and blogged about by so many women today. And the 38-year-old advice is still relevant. Attitudes on the best way to name, feed and teach children change quickly. But when it comes to the experience of motherhood itself, progress is much, much slower. Last week we hit Cornwall’s beaches for a summer holiday. Postponed to autumn because we suspected a holiday might not be very relaxing with three children under four. As it turns out, that long-awaited fourth birthday was not a marked transition towards adulthood, turning oldest chimp into useful third pair of hands. Instead, his chimpacity was ramped-up to record levels. Still, the sun shone, and 80 percent of the week was idyllic rockpooling, dam-building, steam train-riding, farm animal-feeding fun. The other 20 percent we’ll write off as collateral damage. As a freelancer I have a habit of taking work on holiday. From my point of view this is no bad thing. Compared to the daily zookeep, a stint at my desk is rather relaxing. But it doesn’t always go down well with the rest of the party. Like the Christmas I eschewed pudding and post-dinner games for 1000 words on stem cell research (true story). This time I planned ahead and even turned down work (sob) to guarantee a clear week. All the better for starting some long-overdue admin! Step one was ordering three of my own books, J.R. Hartley style, having lost hope of this particular publisher sending advances before they go OP. The idea is to photograph all my new titles together for my website, so I can totally justify spending £20 on a collection of my own words. Totally. And anyway, they have really pretty covers. I see, but do you have it for Kindle? As I was AT THAT VERY MOMENT changing a nappy in the West Country, the delivery driver kindly left the Bookpoint box in our recycling bin. Luckily it was not put out… but nor was the lid put on. I returned at the end of the week to find the books weathered, warped, watermarked and thoroughly unphotogenic. 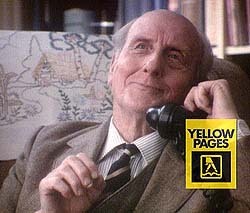 I’m sure J.R. Hartley never had these problems. But then J.R. Hartley probably knew that holidays are not for catching up on admin, but for kicking back, cracking open a beer, and bingeing on Breaking Bad. There are fabulous things about freelancing, but being my own IT department is not one of them. Left to my own devices, all my files sit on my Desktop. 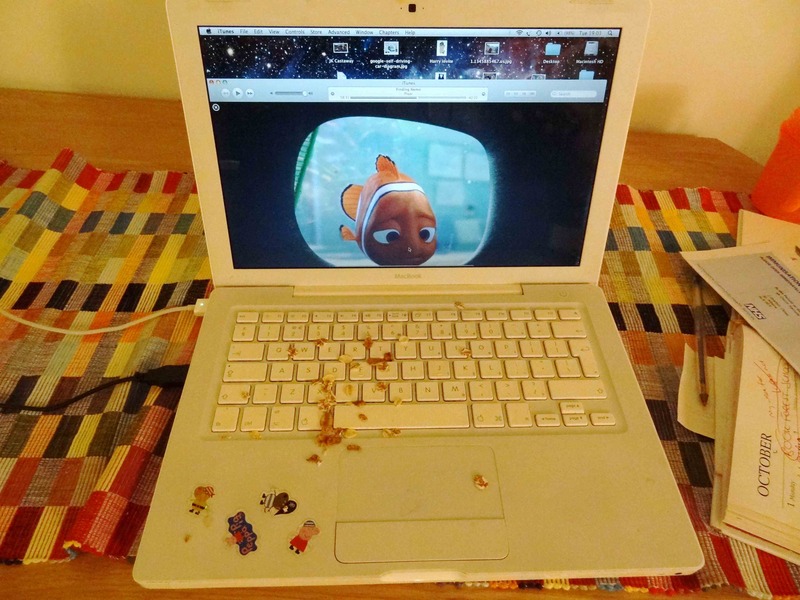 Or, if I’m feeling really organized, in a folder on my Desktop called ‘Desktop’. Software manuals remain unread. 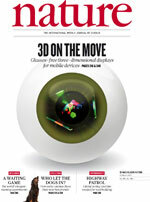 Client-facing websites are abandoned in 2010. My biggest problem is sharing a workspace with two chimpanzees, who have learned to hack into the mainframe and play Disney movies at will. One thinks the screen works like an iPad, but requires more pressure. The other finds the power cord an ideal chew toy for his sprouting molars. Here is the crime scene this evening. What is the error code for keyboard vandalized by Peppa Pig stickers, museli and Biro scrawl? It’s almost enough to make me back up my files. Almost.